Today marks the final installment of my fall capsule wardrobe series on the blog! It’s been so fun showing you guys how I’ve been able to style the same pieces and create multiple outfits with them, and it’s been a fun challenge for me also! When I shop I normally find a piece that I like and don’t really think about how I will wear it or what other pieces I can pair it back to. I’ve always followed the belief in buying things that speak to you and you’ll figure out the rest later, but sometimes that doesn’t always work out! This capsule wardrobe series has challenged me to really think about the items I buy and to determine how I can make multiple outfits with them and truly make them versatile for different occasions. When I started this process I actually created a digital layout of how I would combine all the pieces together and wrote down all of the outfit combinations. It’s amazing how you really can just take a few key items and get 5 outfits out of them! 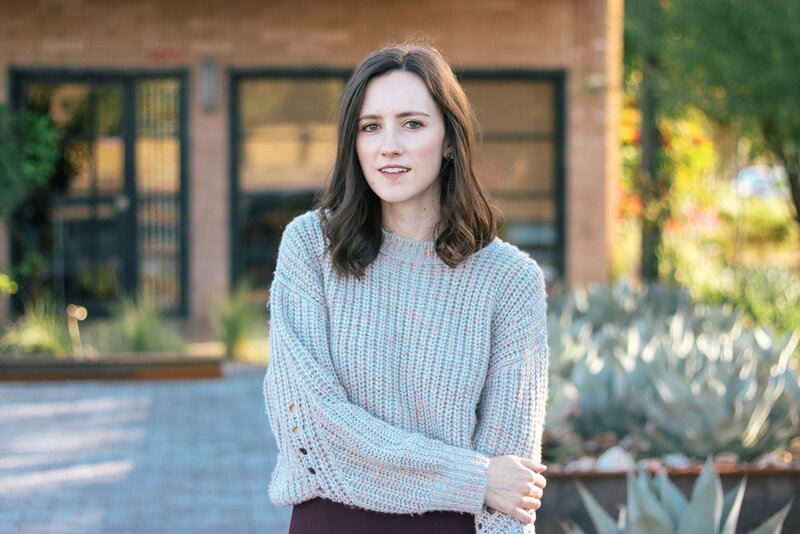 This sweater was really the starting point of the capsule wardrobe, because I knew if I could find a neutral knit that I would be able to do a lot with it. I’ve been able to pair it back to denim, a suede skirt, a blush maxi skirt and now this asymmetrical burgundy skirt (last seen here; similar here)! When you look up close, the sweater has little flecks of pink and orange throughout, so it really gives the knit even more depth and texture. It also is available in a blush pink shade and a rich navy blue! The weather here in Arizona has finally been getting colder so I can finally start to wear all of my sweaters which I’m so happy about! These boots (under $100!) have also been so versatile with all of the fall outfits I’ve put together, and they’re so comfortable! A low, block heel is my favorite kind of heel to wear for that very reason, and it makes them very suitable for walking around and running errands. I’m also adding an over-the-knee boot to my wishlist; I’ve always wanted a pair and I feel like they can elevate any look whether you’re wearing jeans and a sweater or a skirt with tights.